Indian Outfits With Script Print And Embroidery Are Trending! Sarees Trending: Ethnic Wear With Script Print And Embroidery! 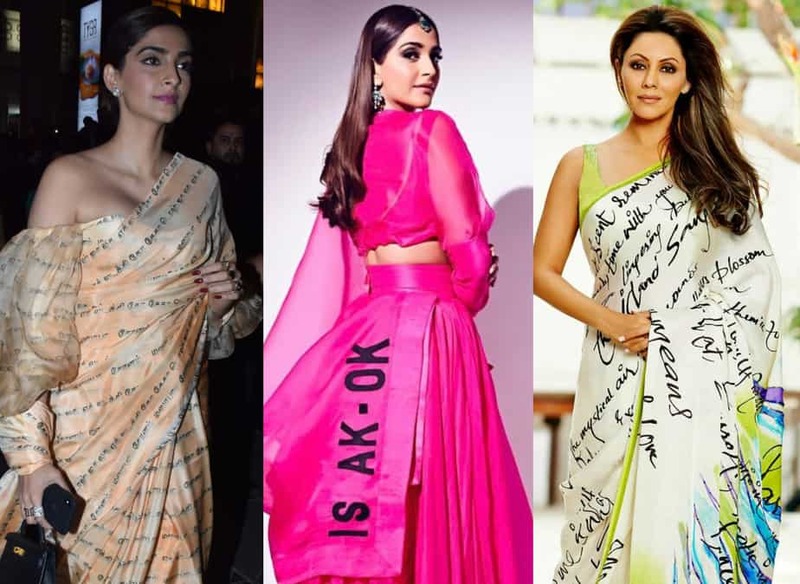 Celebrities like Sonam Kapoor Ahuja, Deepika Padukone and Karisma Kapoor have always been experimental with their sarees. Be it geometrical motifs or floral designs, they love to include some unusual print. The design that sends out a message while also making the saree look ultra chic is their new love. 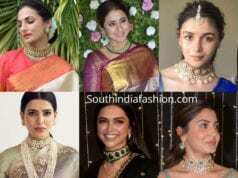 This latest trend in ethnic wear is undoubtedly inspired by the A-list celebrities of B-town. It is the sarees with a script or typography. These scripted sarees include a form of script serves the purpose of sending out a message. In a very specific manner, the message is either printed or embroidered. 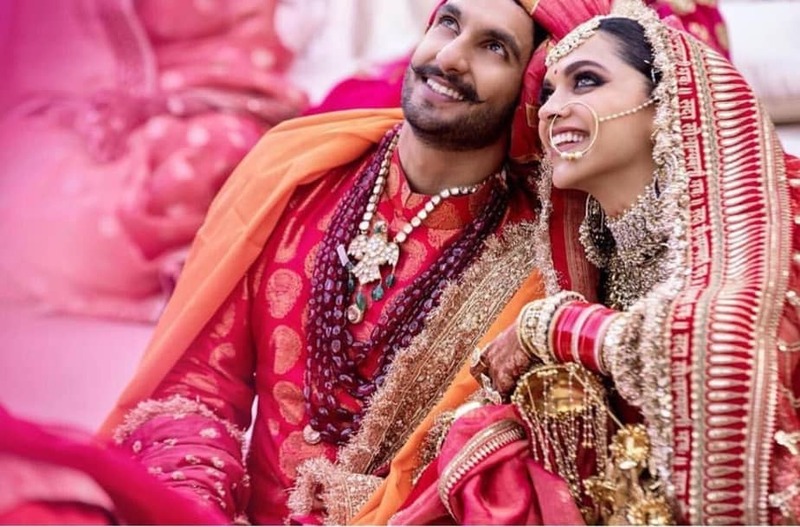 Thus, the scripted sarees and outfits are getting love not just in India, but universally. SouthIndiaFashion through this blog looks at five ace designers and their muses who have included the script in their ethnic collection and set out a trend that is here to stay for a while. 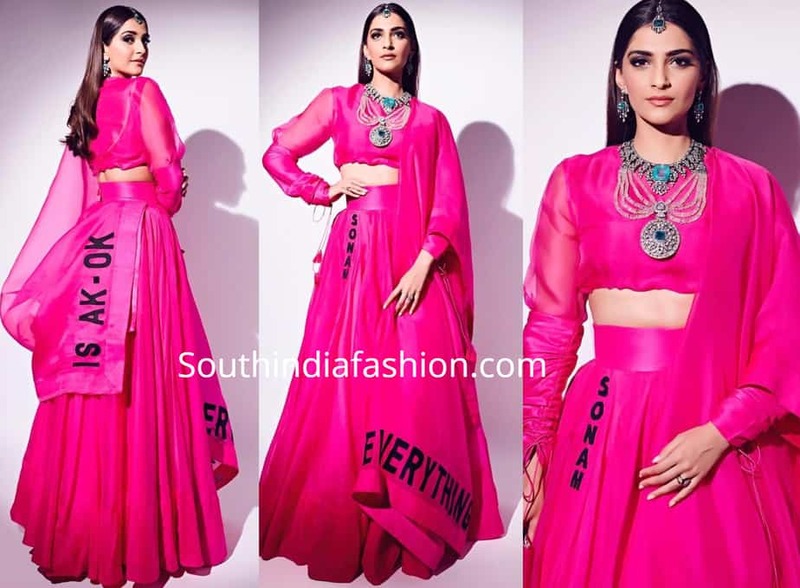 Sonam Kapoor Ahuja has always been a head turner when it comes to style and so is designer Masaba Gupta, from “The House of Masaba”. 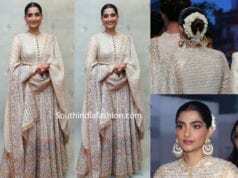 Recently during the promotions of her latest movie, Sonam wore a mellow yellow sari by Masaba Gupta that featured script print in Tamil that translated to “Sonam, Masaba and Ek Ladki Ko Dekha Toh Aisa Laga”. 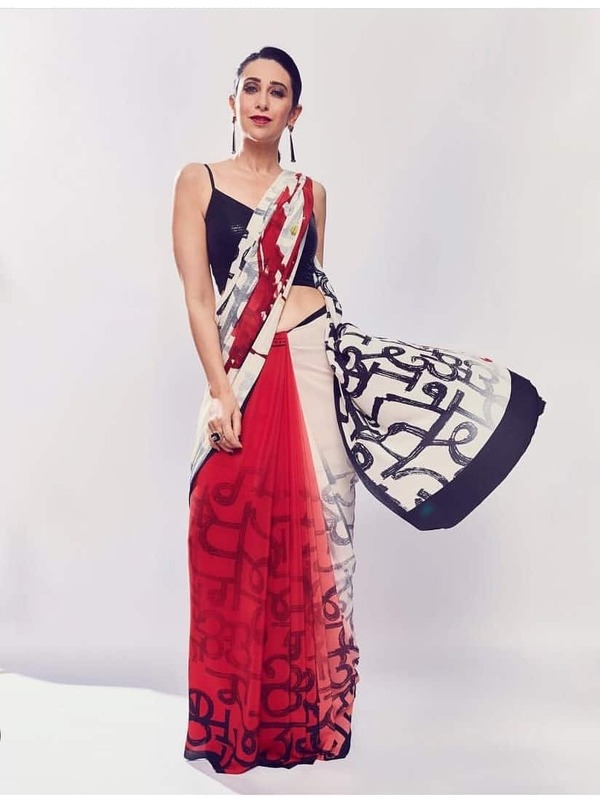 Saree from “The House of Masaba”. 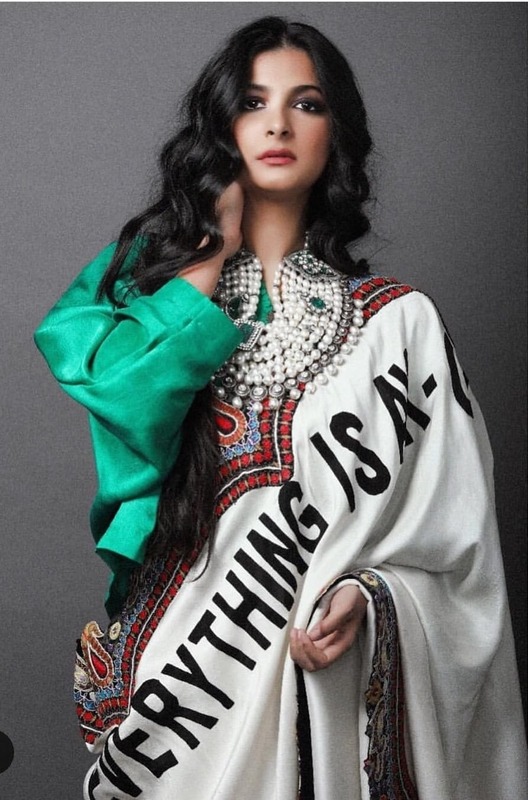 Rhea Kapoor, a stylist herself and her sister Sonam Kapoor Ahuja are always one step ahead when it comes to their style game. The siblings recently wore chic personalized sarees by A-list designer Anamika Khanna. The saree featured their names along with a significant phrase, “Everything is AK-OK” that the sisters use a lot among themselves. 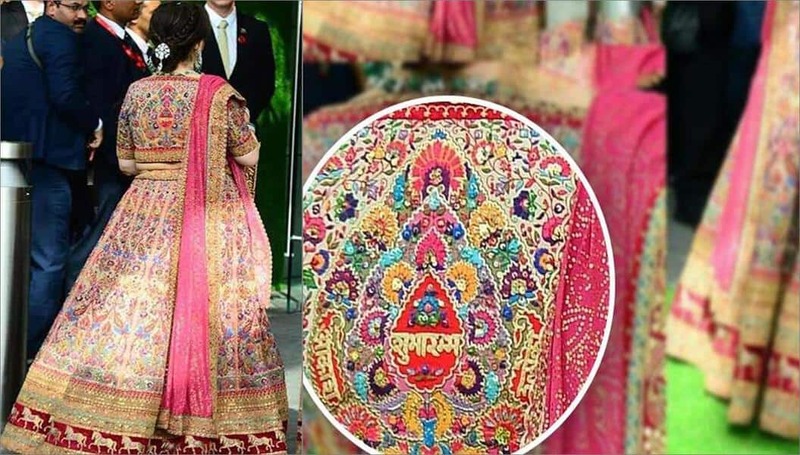 During her son Akash Ambani’s wedding to Shloka Mehta, Nita Ambani wore a lehenga choli set by Sabyasachi. It has eye-catching embroidery with the words “Shubharambh” in Devanagari—which literally translates to “A good beginning”. Karisma Kapoor, a self-confessed saree lover, recently wore an elegant typography-printed sari designed by Satya Paul. The saree spelt out ‘Mirchi’ in Devanagari script literally translating to chilly (BUY HERE). The typography print sari looked quite contemporary while also telling a story. 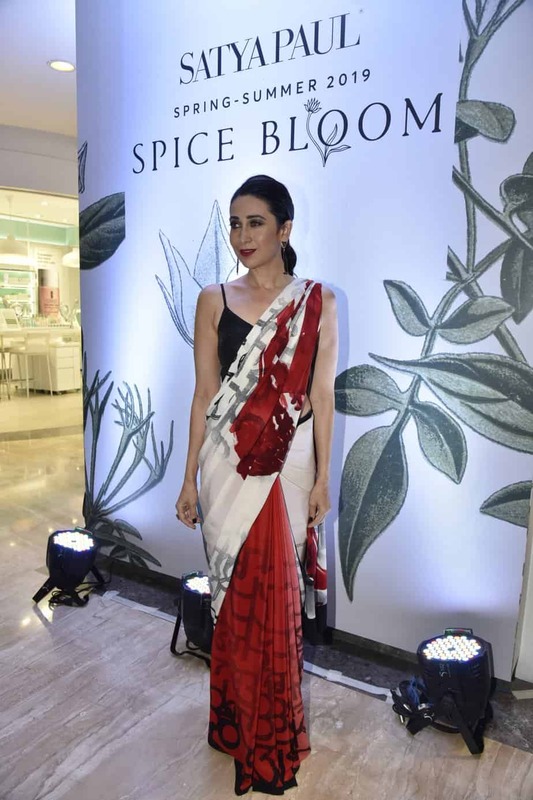 Karisma Kapoor said she wore this saree as it was a novel idea and can represent her language when she is travelling to other countries. We are pretty sure about your love for these novel script sarees. These scripted sarees with a message from our celebrities can set you like a style statement. So go ahead and tell your story with the most elegant and classy six yards of fabric and make sure you make a style statement.